Friday, October 4: Residents in Mojave may have noticed some men cleaning and boarding up a distressed property on Inyo Street last Friday. This property, kitty-corner from the elementary school, on Inyo has been a dangerous invitation for drugs and crime for years, and finally it is secure. The two men were from Kern County’s Code Compliance department, which is preparing to launch a new campaign in Mojave. “We go anywhere they tell us” according to one of the men, who arrived earlier that day from Bakersfield. 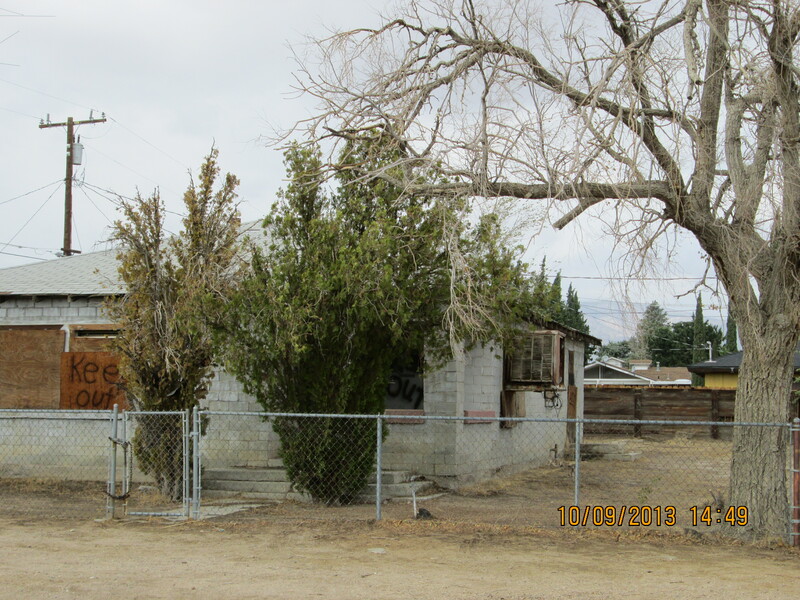 The Mojave Foundation is determined to clean up and secure these vacant properties, and eventually demolish these derelict structures, which present an immediate danger to public health and safety. We look forward to working closely with Code Compliance and applaud their efforts to make Mojave a safer, more attractive place to live. This entry was posted in Uncategorized on October 9, 2013 by mojavefoundation.